Considered an outstanding Studio at The Whaler, the closest resort to the ocean front on Kaanapali Beach. A+ Designer Remodeled, Spectacular View of the entire Bay of Black Rock, and across the ocean to Molokai. From the King bed, with the most comfortable mattress [top-of-line, as used at The Ritz], the Ocean is reflected in the floor to ceiling mirrors. California style walk-in closest has build outs, large drawers, cubbies, and plenty of storage and hangers to instantly unpack. CD/DVD, library of CD's, DVD's, Books, etc. Desk if you must work; upgraded secure WIFI with private secure password for this unit only. The Whaler has free Washer/Dryer's on every floor, located near the elevator bank,. Our home is in Rancho Mirage, California; however Maui is our treasured second home. As a guest at The Whaler for over 20 years, I wanted my own 'home-away-from home'. The Whaler condominium property is unique in that it is on Maui's #1 white sand beach, ocean front swimming. Kaanapali golf course across the parkway. There are many restaurants, and world class shopping next door at Whalers Village, which also has an ABC convenience market. The great snorkel beach at Black Rock is just steps away. The Whaler Condo/Hotel with front desk services, activities/concierge service, business center, bell desk, gym, sauna, spa and salon, meets every travelers needs. Wonderfully upgraded, totally remodeled and designer furnished, the intimate lanai has and a spectacular view of the entire bay of Black Rock. During winter months, you can watch the whale migration from the lanai. The expanded full size kitchen is a pleasure to work in, with the ocean reflected in the mirror wall. Whalers Village with numerous stores and restaurants. Shared, on every floor, free of charge. No Charge. Underground and 2 outside lots. Password - private access for Studio 814 only. Tower 1, North, 8th floor Studio #814, has MOST PRIVATE LANAI, above 6 story KBH. Fabulous views of the entire bay of Black Rock and across the ocean to Molokai island. Completely renovated and enlarged with light maple cabinets, under cabinet lighting, raised ceiling, granite counters, new appliances. The Front Desk supplies racquets, balls for guest use. Tennis Pro onsite. Lovely condo. Well kept and current. Great location! It was everything as advertised. The condo was in excellent shape and very comfortable. Great location. We would definitely do it again. This unit was just what we needed. It is nicely appointed with comfortable and inviting furniture and decor, with an island-inspired theme. The kitchen has excellent appliances with everything we needed for food preparation and dining. The bed is comfortable and provided a great night’s sleep. There is lots of closet space and the bathroom is also lovely. It is great to sit on the lanai and enjoy the view of Black Rock. Great location and very enjoyable unit. We would highly recommend it. We've stayed at the Whalers before and noticed a lot of changes. It's nice to see that the building continues to be well maintained. Your unit was very comfortable with a lot of tasteful touches. We appreciated being able to use the washers and dryers for free. (I'm sure the desk staff also appreciates not having to make change for occupants!) We did miss the locking safe in each unit though, but that is a small nit. We had a very pleasant stay, and will definitely be back one day. 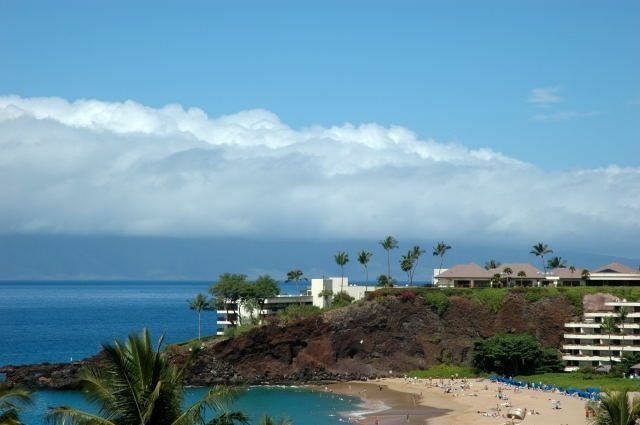 Kaanapali Beach has fantastic snorkeling in the Bay of Black Rock, in front of the Sheraton Hotel just North. The beach is Maui's #1 beach and one of the 10 best beaches in the world. Walk to Whalers Village shopping center and restaurants next door, South side of Tower 2. From our super most private location on the North side of Tower 1, we do not have cooking smells from the restaurants, nor the very early morning trash and delivery trucks to Whalers Village.